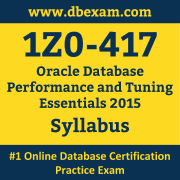 You can use this exam guide to collect all the information about Oracle Database Performance and Tuning Essentials 2015 (1Z0-417) certification. The Oracle 1Z0-417 certification is mainly targeted to those candidates who has some experience or exposure of Oracle Database 12c and want to flourish their career with Oracle Database Performance and Tuning 2015 Certified Implementation Specialist (OCS) credential. The Oracle Database Performance and Tuning Essentials 2015 certification exam validates your understanding of the Oracle Database 12c technology and sets the stage for your future progression. Your preparation plan for Oracle 1Z0-417 Certification exam should include hands-on practice or on-the-job experience performing the tasks described in following Certification Exam Topics table. - Differentiate Oracle product technology for database performance within the Oracle portfolio, competitive marketplace and the opportunity available to partners. Architecture - Identify the type of hardware on which the solution / product runs for specific customer scenarios. The Oracle 1Z0-417 Certification Program certifies candidates on skills and knowledge related to Oracle Database 12c products and technologies. The Oracle Database Performance and Tuning 2015 Certified Implementation Specialist is granted based on a combination of passing exams, training and performance-based assignments, depending on the level of certification. Oracle 1Z0-417 certification is tangible benchmark of experience and expertise that help you stand out in a crowd among employers. To ensure success, Oracle recommends combining education courses, practice exam and hands-on experience to prepare for your Oracle Database Performance and Tuning Essentials 2015 certification exam as questions will test your ability to apply the knowledge you have gained in hands-on practice or professional experience.